Christos Markadjis, Dina Kapitsi and Christos Michaelides with Andreas Nikolaides (back to camera) in "Little Odysseus and the Cyclops"
For the first tme in the Greek world comes a film for all the family inspired by Greek mythology, using the latest digital technology to create impressive visual images. Based on the Homeric story of Odysseus and the Cyclops, adapted to modern day, "LITTLE ODYSSEUS AND THE CYCLOPS" combines fantasy, comedy and adventure. Filmed entirely on the island of Cyprus in stunning locations and at the Acropole Cinema Studios. Three talented Cypriot children take leading parts - Christos Michaelides, Dina Kapitsi and Christos Margadjis. 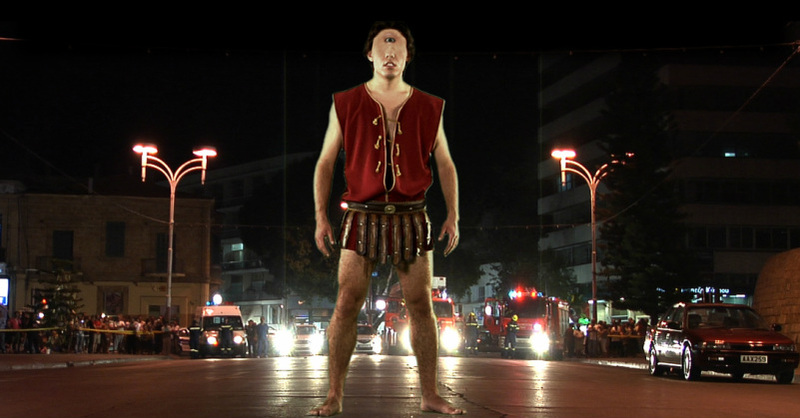 A family film in more ways than one, "LITTLE ODYSSEUS AND THE CYCLOPS" is written, produced and directed by Michael Papas, co-produced by Susan Papas and photographed by Minos Papas .